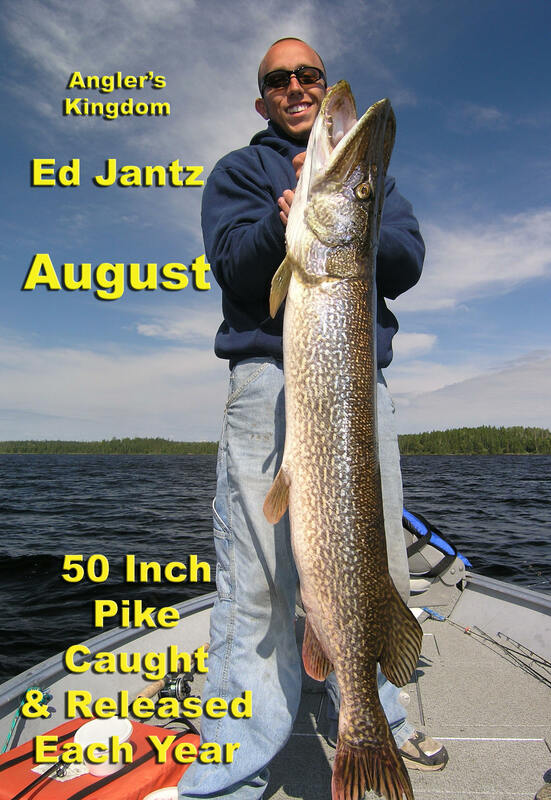 Trophy Northern Pike and Walleye Fishing near Red Lake Ontario Canada. 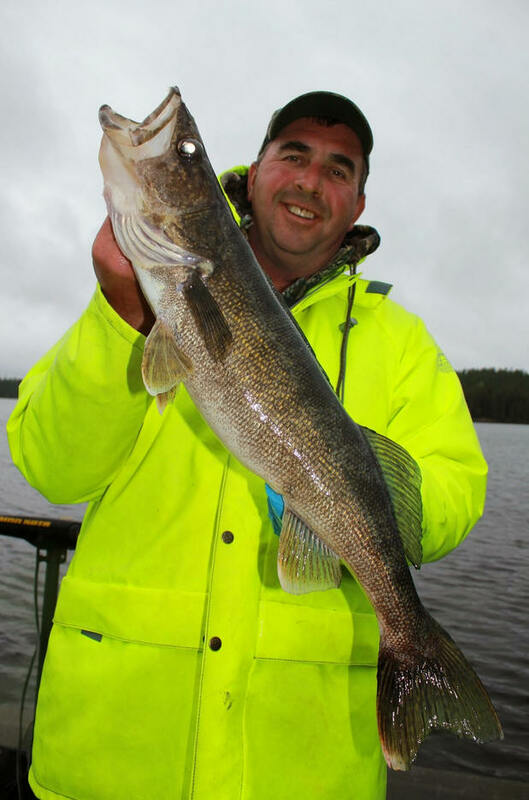 Fly-in Quality fishing without the expense or limitations of a Fly-in. 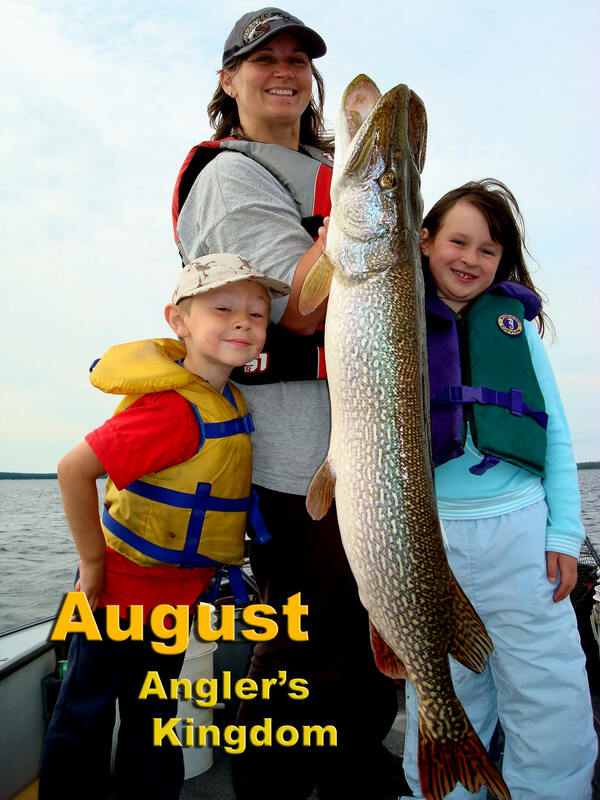 Angler's Kingdom is first and foremost a sport fishing camp, NOT a big, fancy, busy 5 star resort with all the extra activity of such an operation. 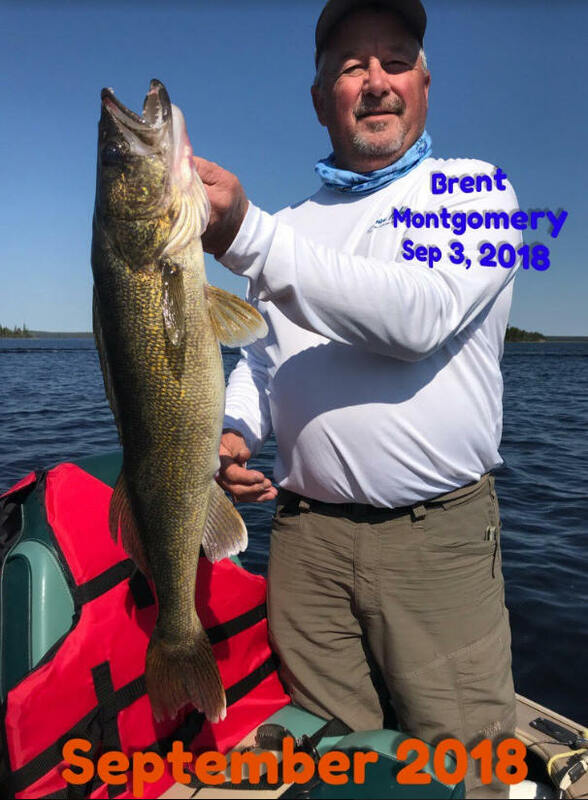 Our guests catching the fish of their dreams is our number one priority. 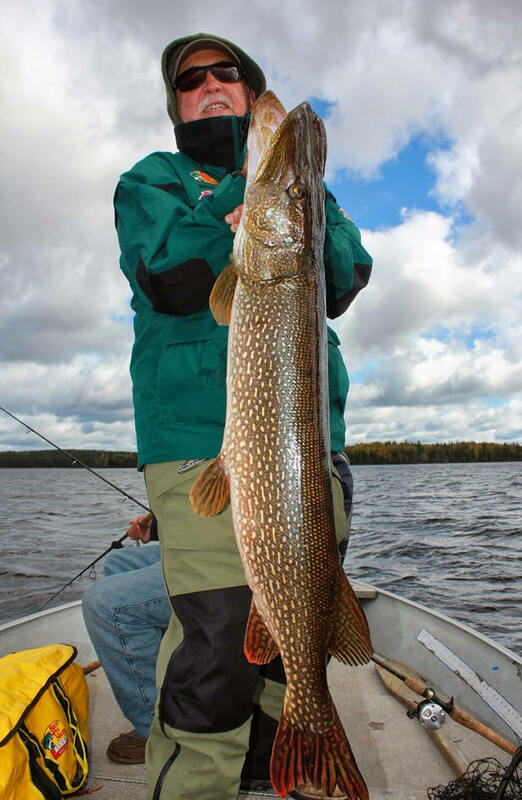 Trophy pike and Walleye is what we're all about. 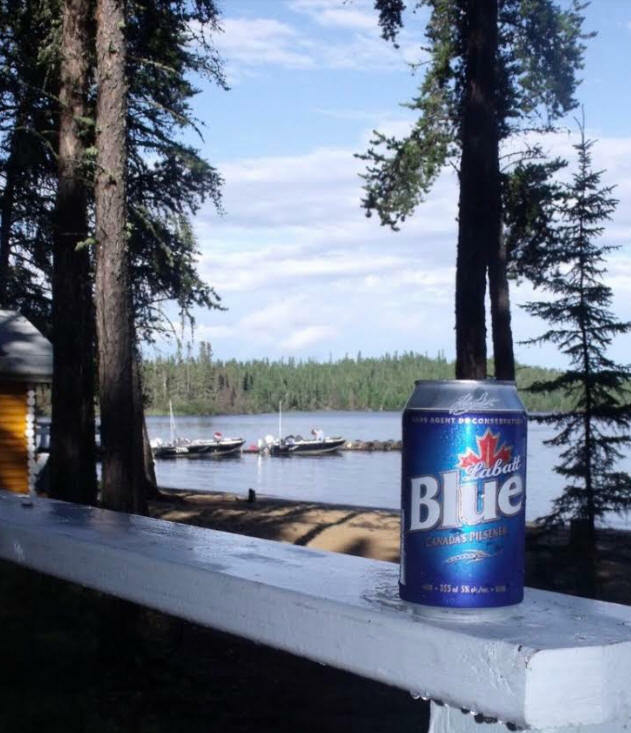 Deep in the Canadian wilderness beyond the highways 30 miles north of the town of Red Lake in Northwestern Ontario. 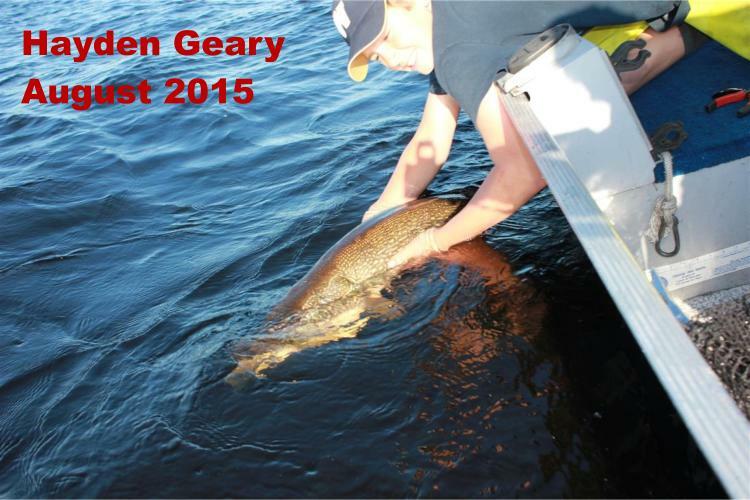 and Release Trophy fishing can be reached by boat and portage without the expense of flying. 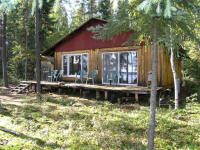 The portage is short & easy via ATV across our private 300 yard boardwalk. 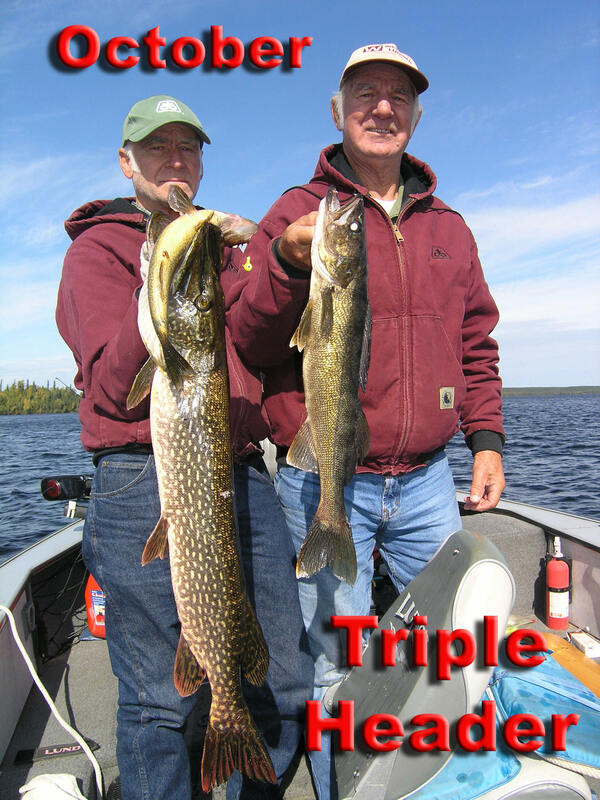 However our portage acts like a gate allowing only limited fishing pressure on the remote unspoiled waters of Nungesser lake. 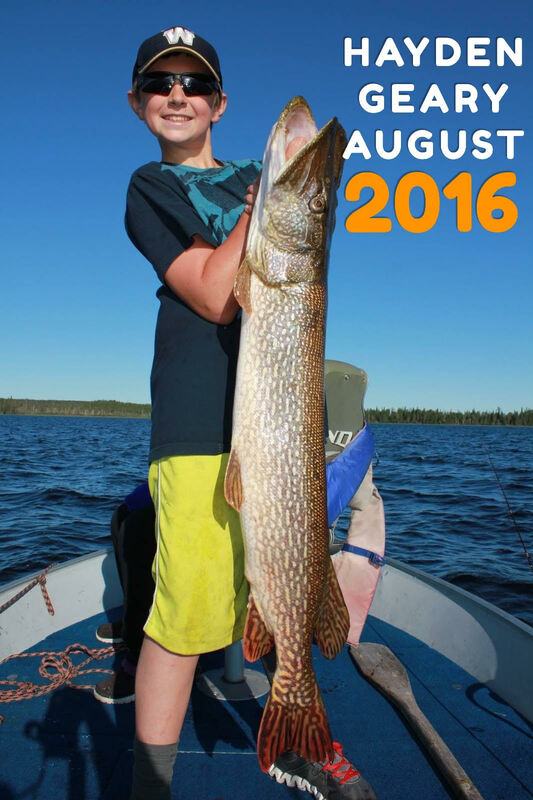 Check out our new Nungesser Lake Map! 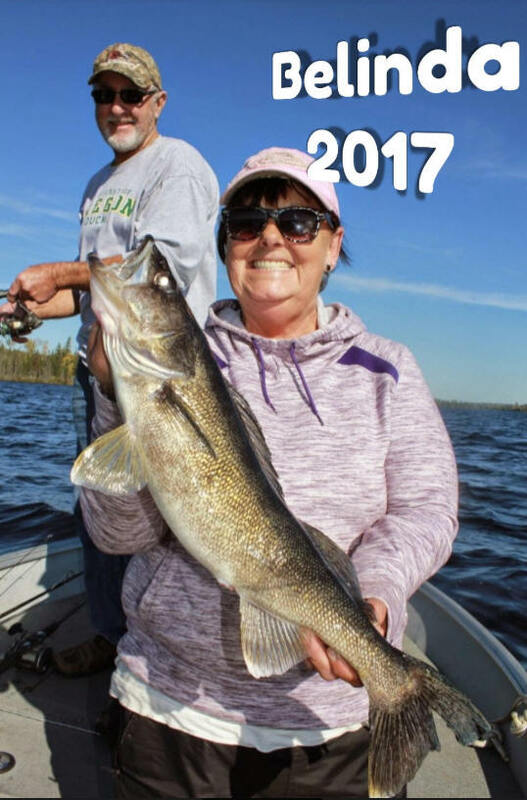 In each of our first 12 years (2005 -2017) ten pound walleye (30 “ range) and 30 pound pike (50 “ range) were caught and released. 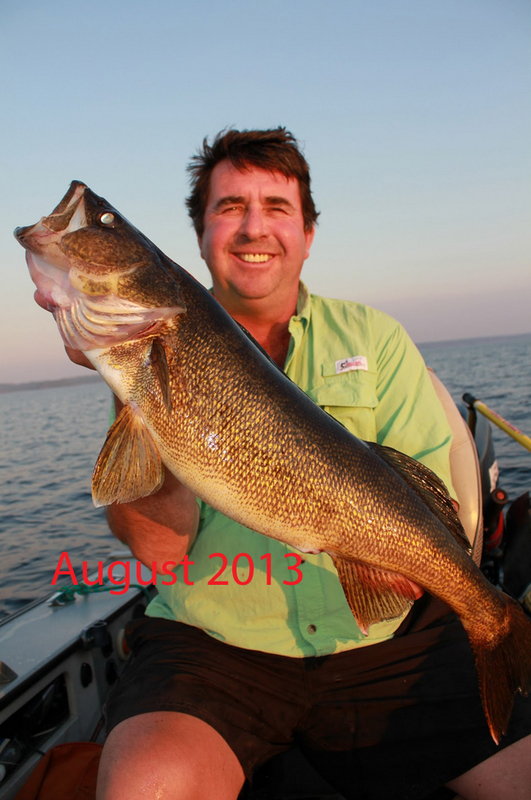 To date the largest walleye was 32 inches the largest pike 54 inches. 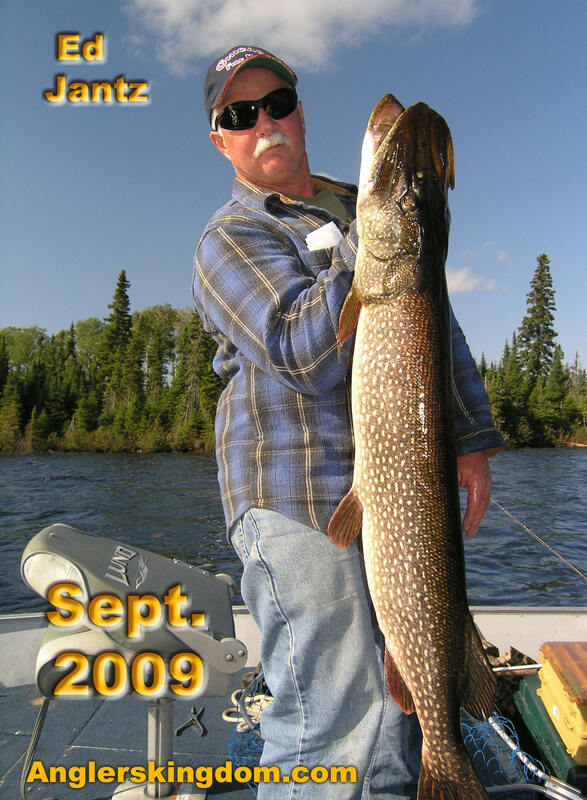 The largest pike caught in 2009 was 49 inches, it was very very thick and likely over 35 pounds. 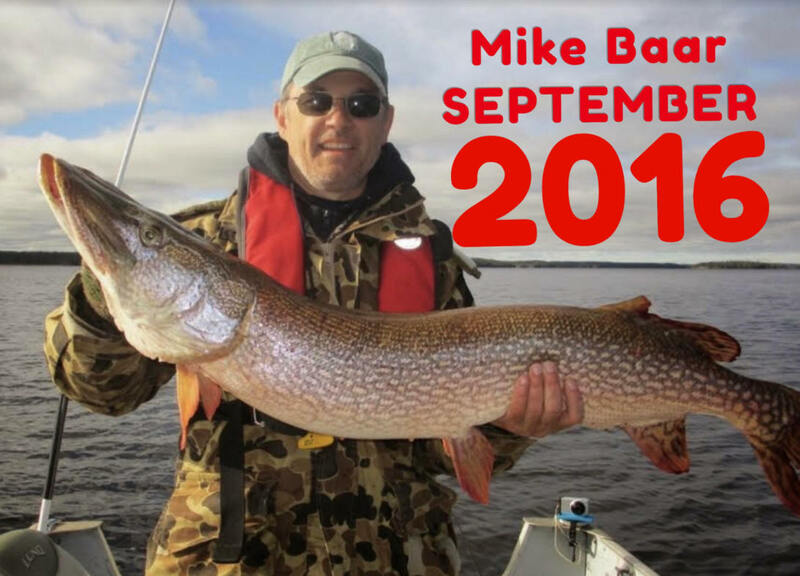 If your looking for numbers of 12- 18lb pike there are better lakes to try. 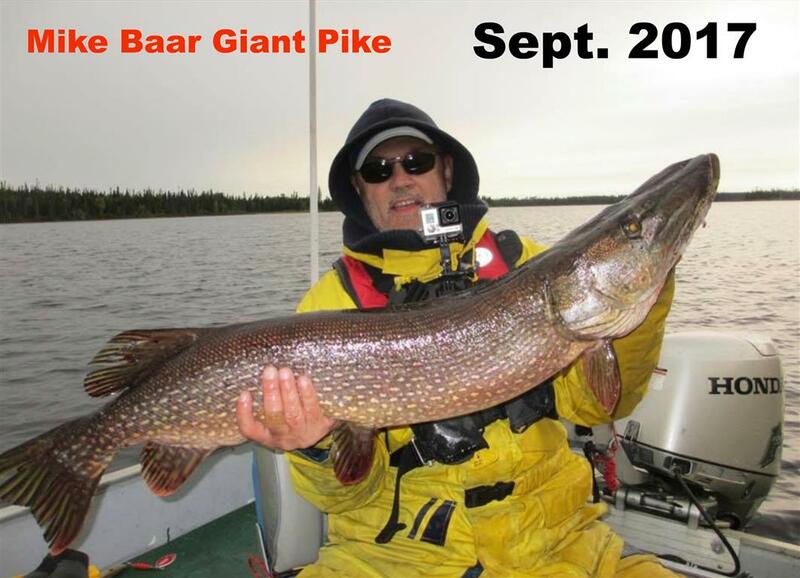 If you want a true Trophy Pike in the 45-50 inch range then your looking at the right place. 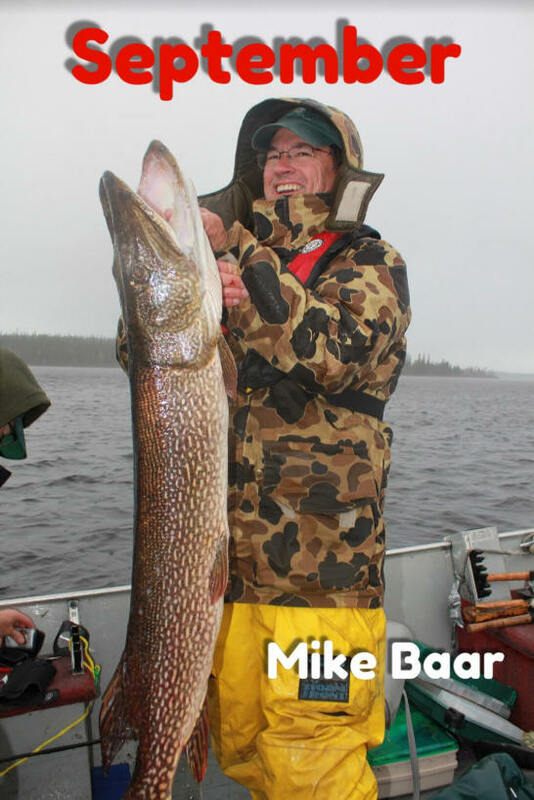 Don’t get me wrong - not every guest will catch a pike over 45 inches but I believe your odds are better here than anywhere I’ve fished. 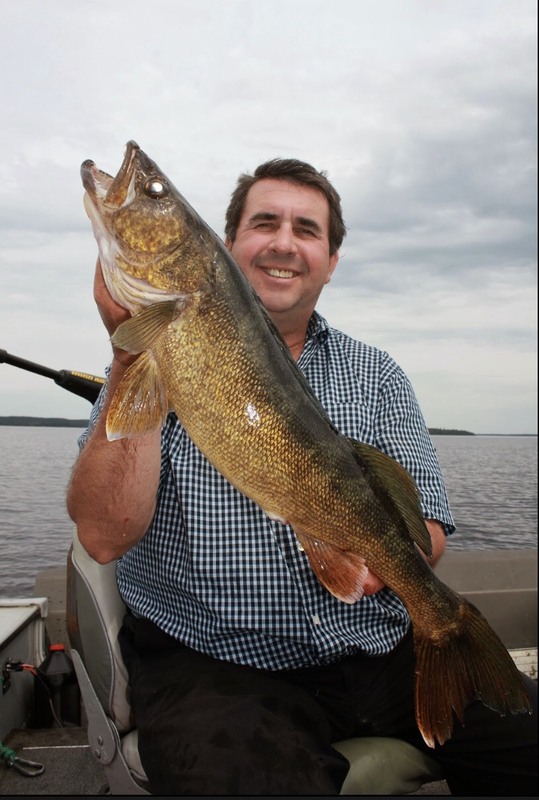 I’ve been fortunate enough to have fished over 300 of the best walleye and pike lakes in Canada. 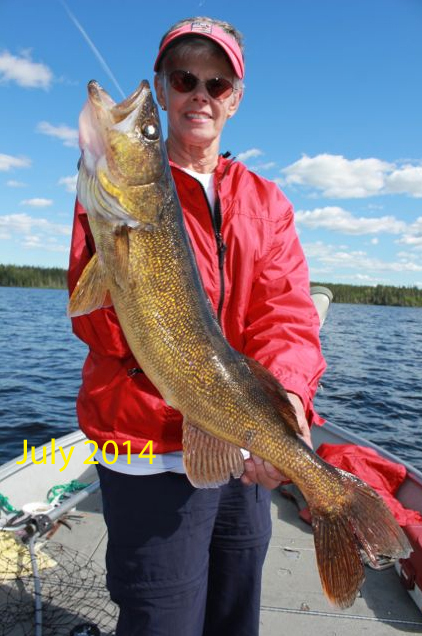 Approximately 70% of our guests report catching the largest fish of their lives. 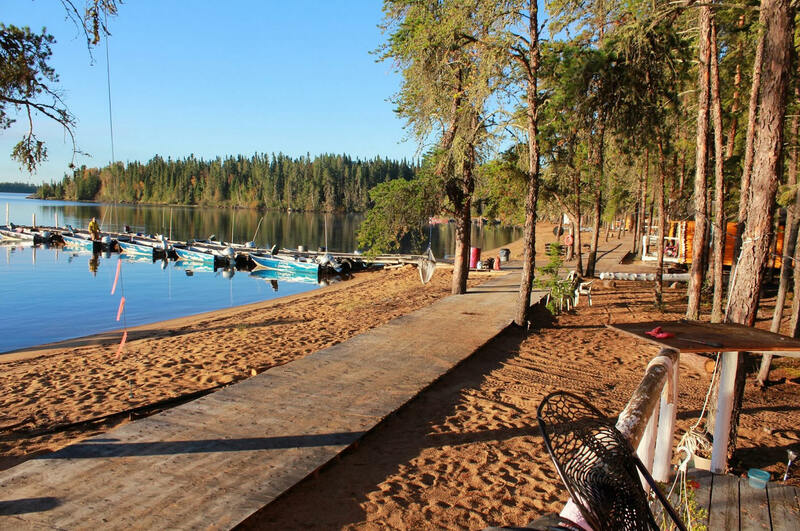 The phenomenal production of Nungesser is not surprising considering this approx 30,000 acre lake has the perfect blend of ingredients. 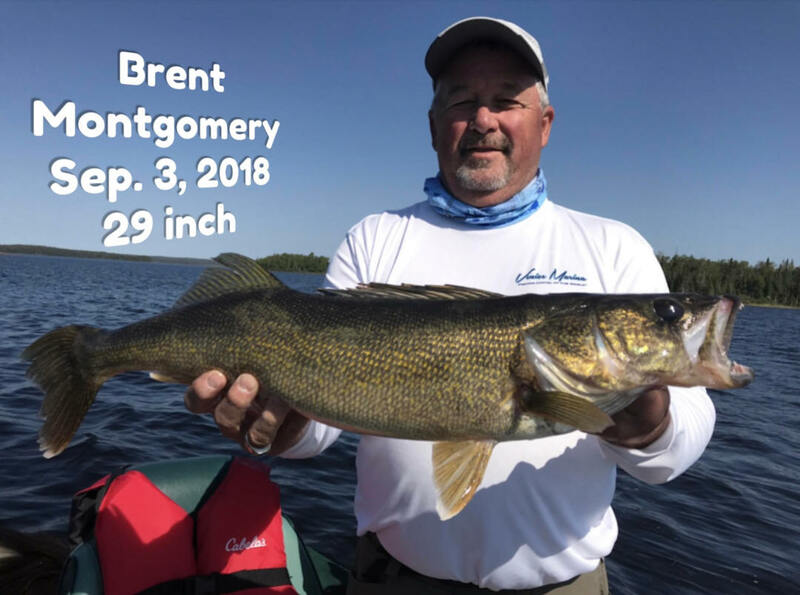 Over 100 miles of rock and sand and gravel shorelines, sand/gravel bars, mid lake reefs and humps, deep water access, long shallow bays and lush cabbage and reed beds for crustacean, zoo plankton and other forage production. 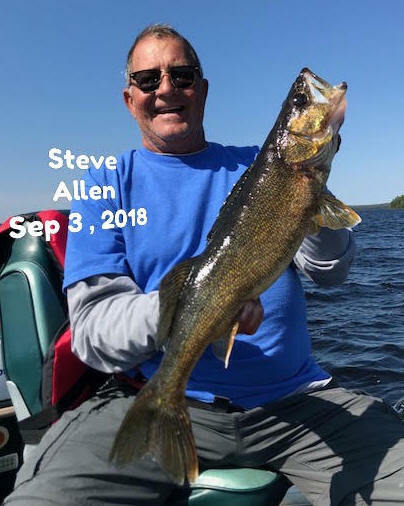 They combine with over 20 rivers and creeks to provide excellent spawning areas for Walleye, Giant Pike and the Whitefish, Suckers, Perch, Ciscoes, Shiners and other bait fish they require for sustained growth. many areas over 25 feet deep with several sections over 50 feet deep. 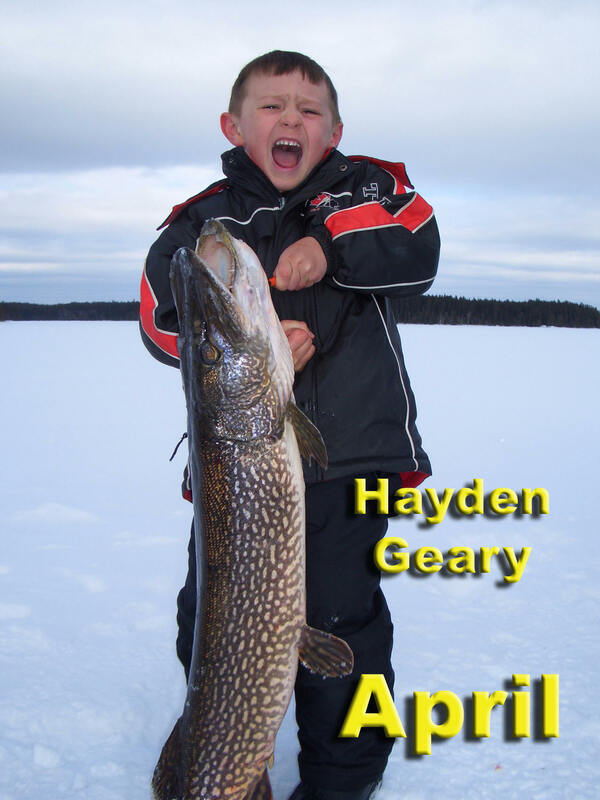 This website is designed to assist you in your fishing adventure before you even leave home. 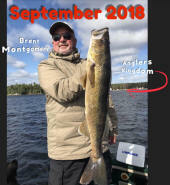 Please look around for instructional articles on fishing, detailed lists of recommended tackle and suggested items to bring. 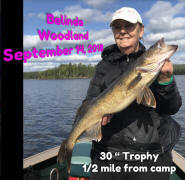 You’ll find our contour map of the lake and maps on how to reach us. 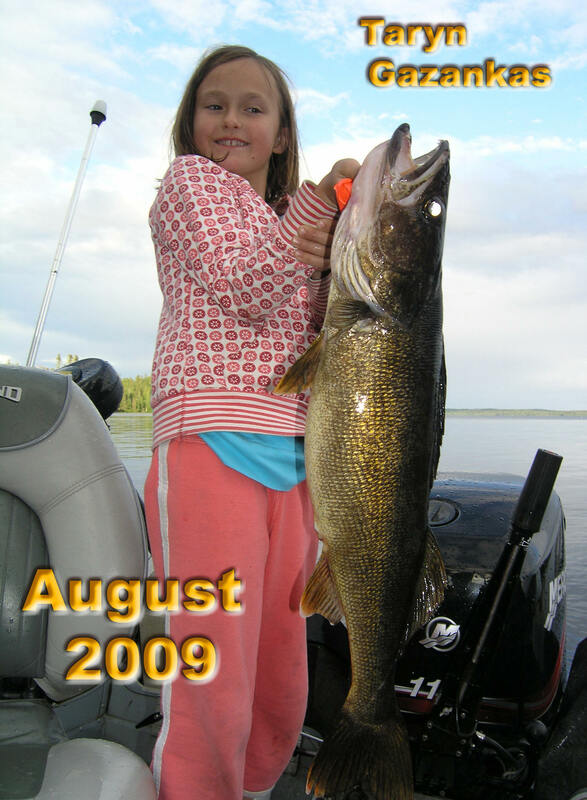 Check our 2005 thru 2008 photo albums and our 2009 thru 2018 current fishing reports for thousands of photos and fishing reports from our first 10 seasons. 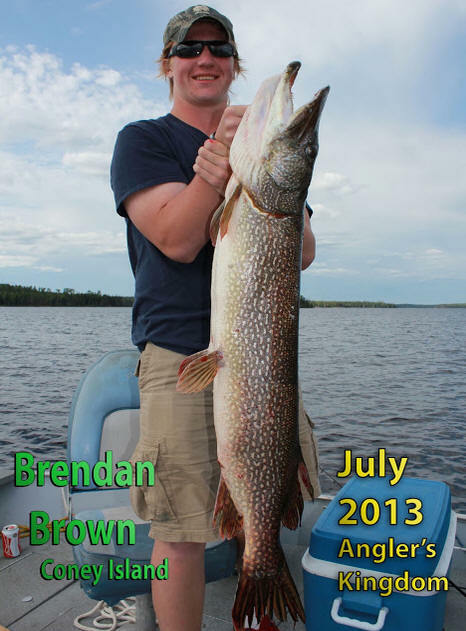 Upon arrival I will provide you with our custom printed contour map of Nungesser outlining the lakes best features. 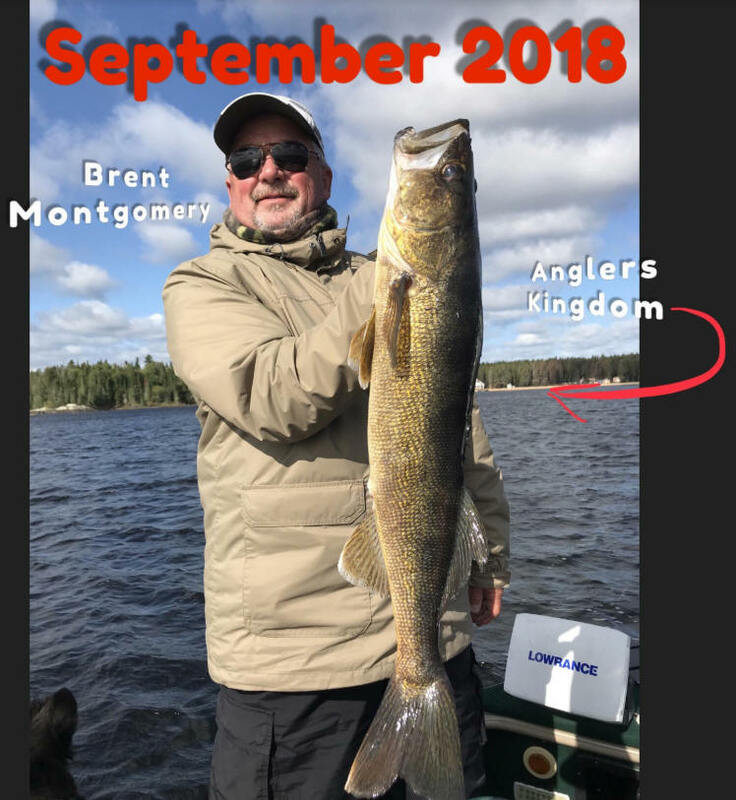 I’ll go over the map with you to point you in the right direction and put you on fish. 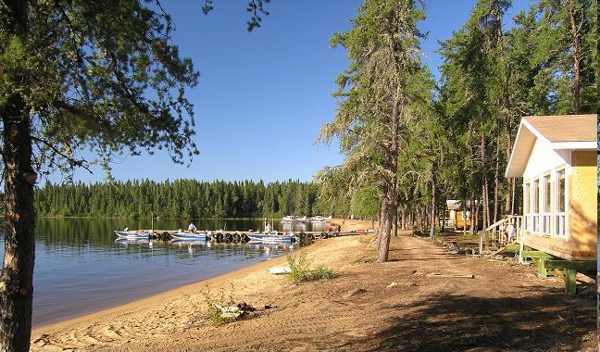 Your cabin is nestled among the trees on the shores of Pine Island overlooking 1,000 feet of beautiful sand beach. 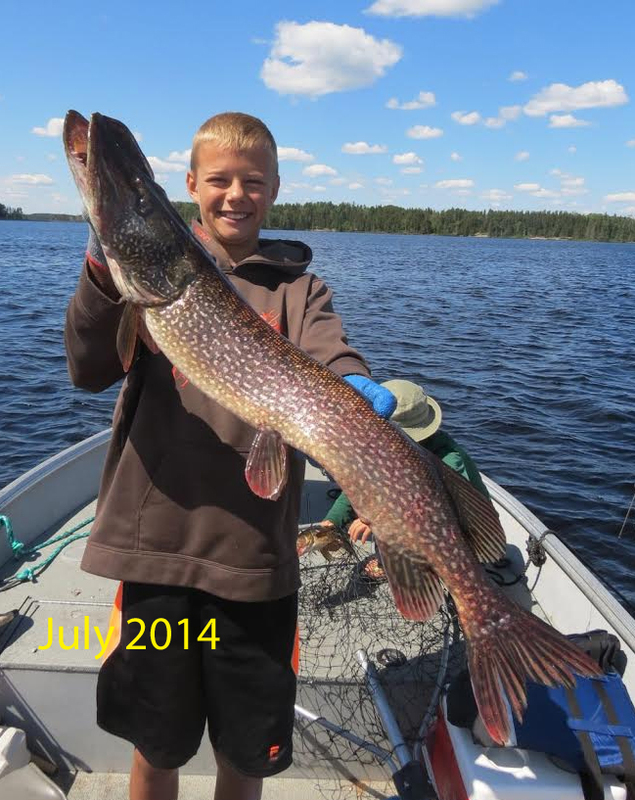 Your Wilderness Kingdom lies within a few minutes of Nungesser lakes most prolific trophy Pike and Walleye waters. 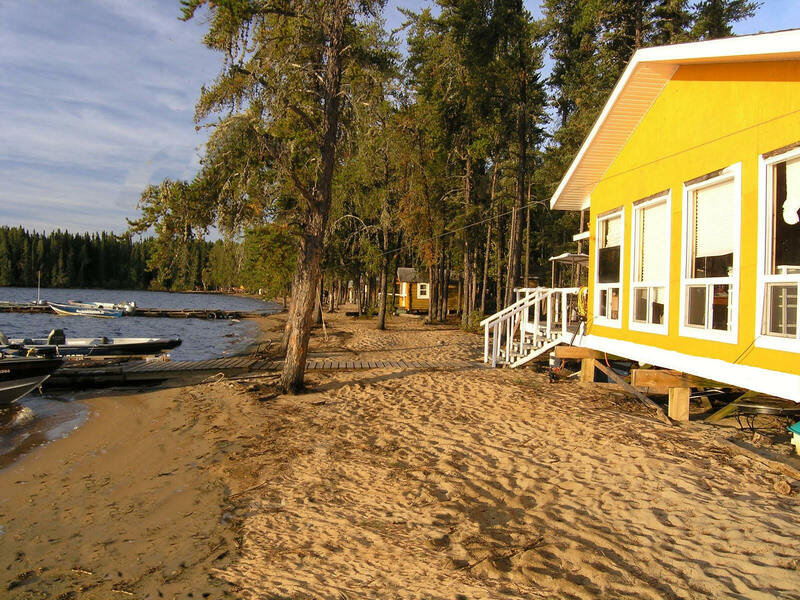 Pine Island is the Calving ground for the areas Woodland Caribou. 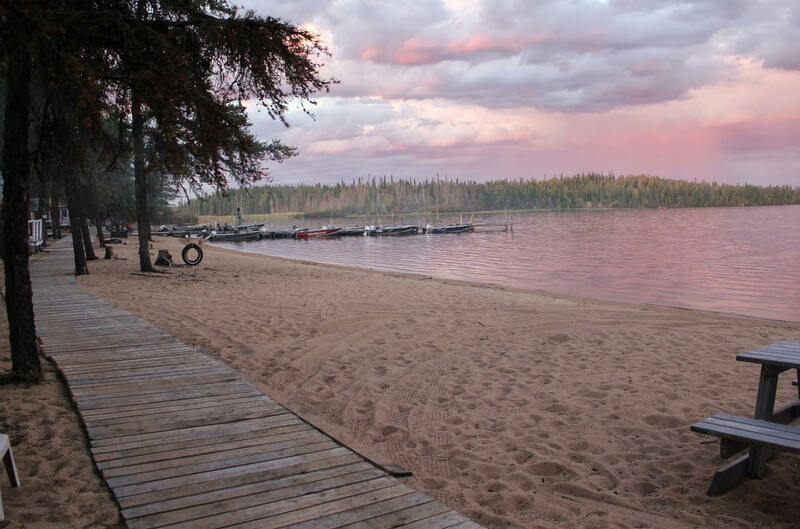 there are seven Bald eagle nests within a one mile radius of the camp. 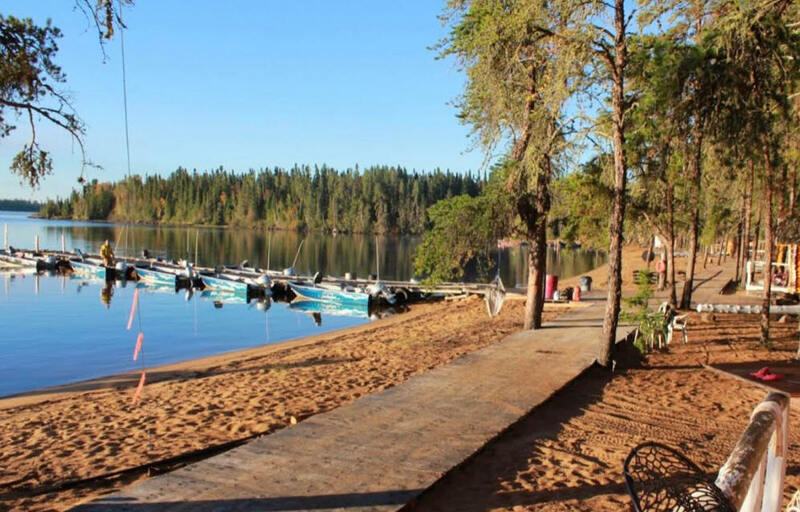 The Caribou, Loons, Eagles, Wolves and majestic Moose will be your companions as you explore this remote unspoiled wilderness paradise ”beyond the roads”. 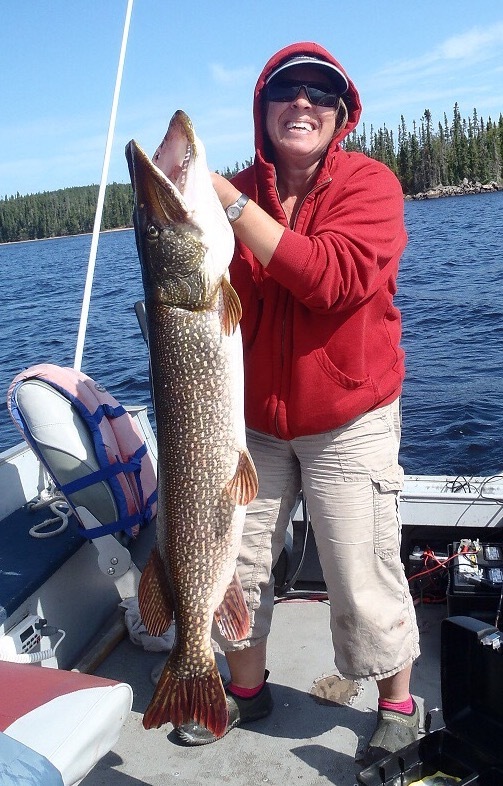 The vast unpressured waters of Nungesser Lake will be your kingdom for the week. 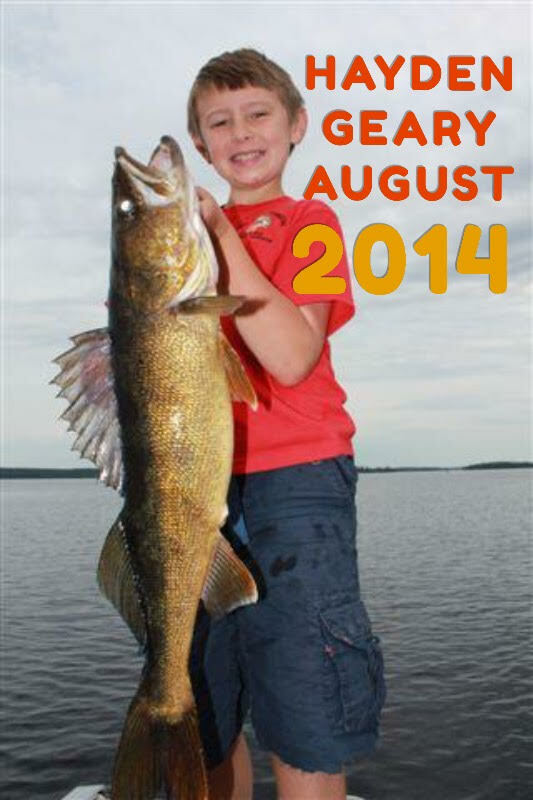 Click on any of the fish pictures to enlarge them!! 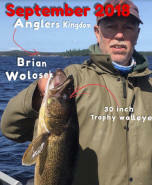 Outfitted with top of the line sonar units with 9” screen,down imaging, CHIRP and GPS. 25 watt Radios and first class anchoring systems. 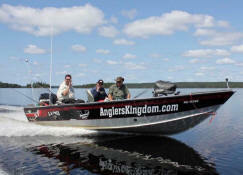 Of course livewells, minnow wells, bilge pumps, nice comfortable seats and trolling motors. 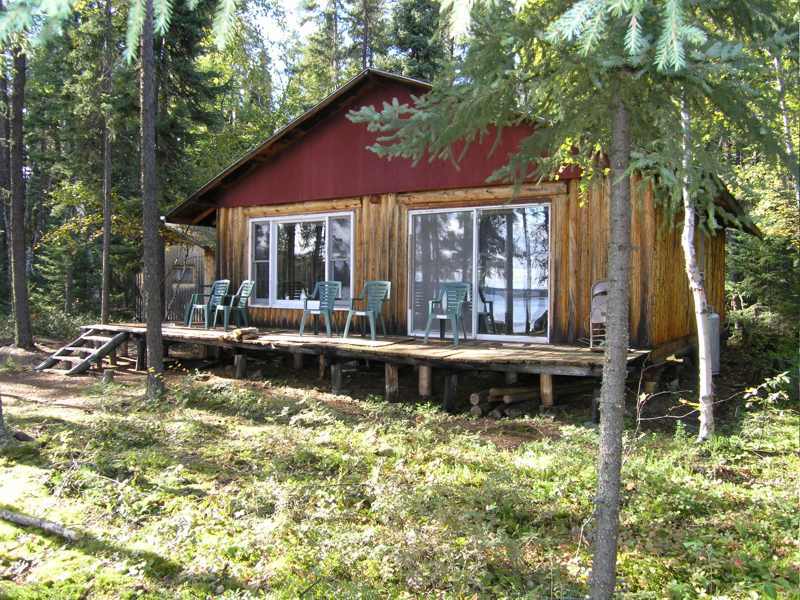 A few steps from you cottage door await your 17.8 foot Lund Outfitter with a 40 or 50 hp Honda motor. Few if any remote camps provide equipment of this quality. 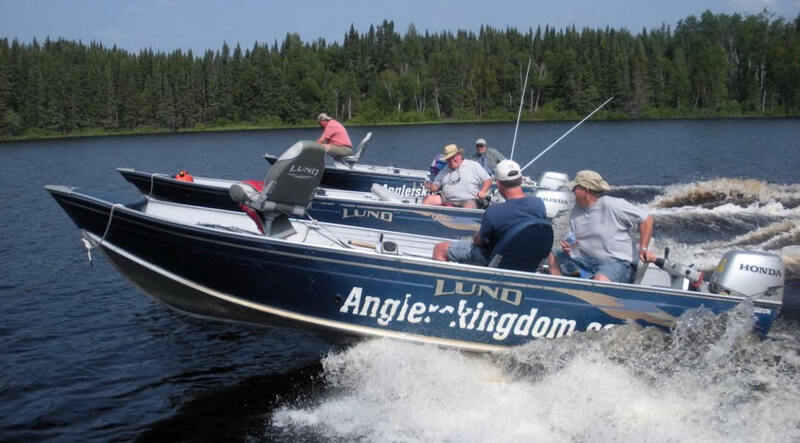 The comfort and safety of these boats is unmatched. 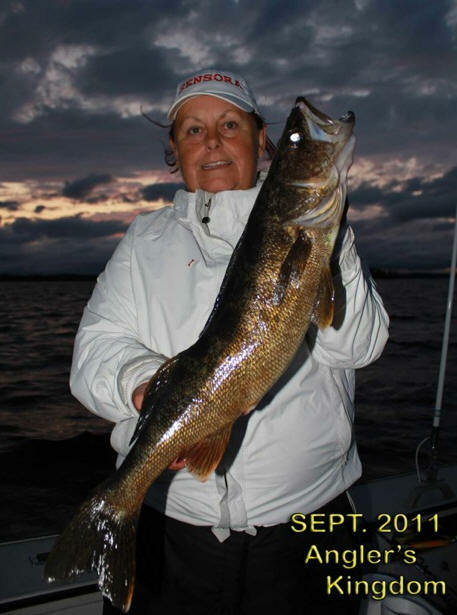 Our guests enjoy long days on the water getting worn out catching fish not tired due to small uncomfortable boats. These fishing machines are fully equipped with trolling motors, depth finders, live wells, casting decks, swivel pedestal seats and marine radios for an extra measure of safety. 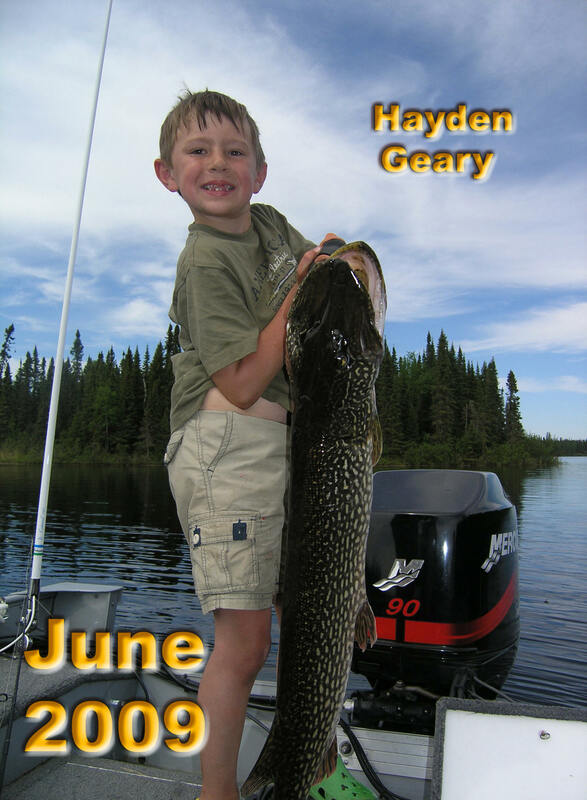 Of course we provide nets, life vests, anchors, paddles, maps, emergency kits. 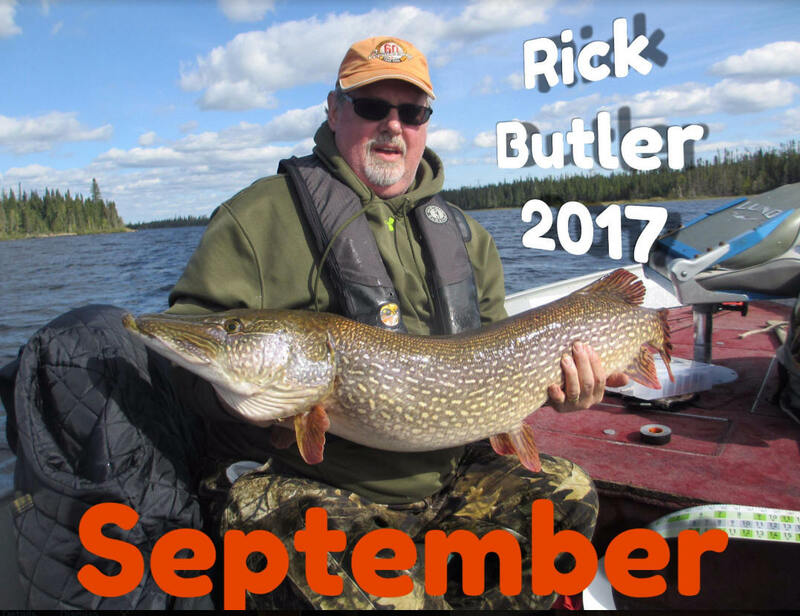 Having spent a lifetime in the out of doors I am aware that most anglers appreciate being safe and comfortable while on the water. 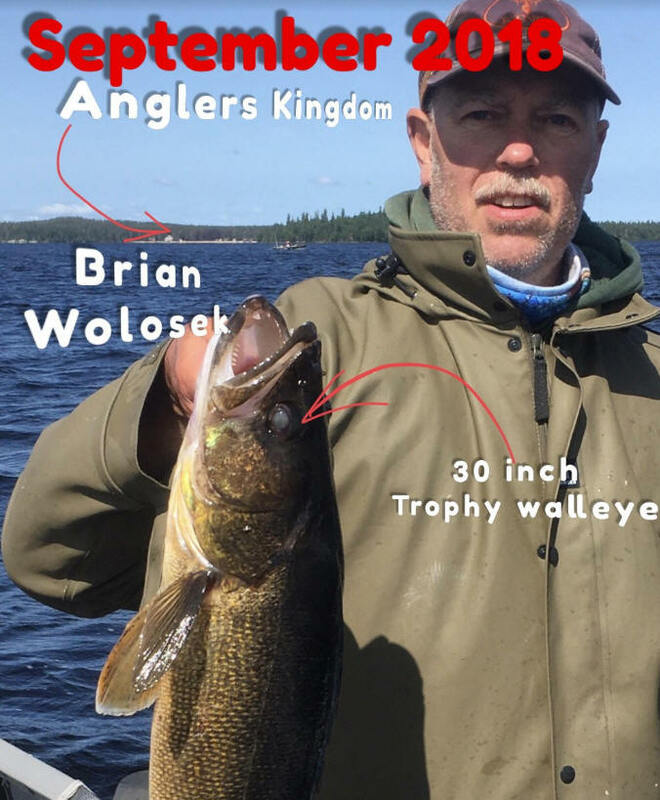 Our guests spend the majority of their waking hours in pursuit of their trophy. 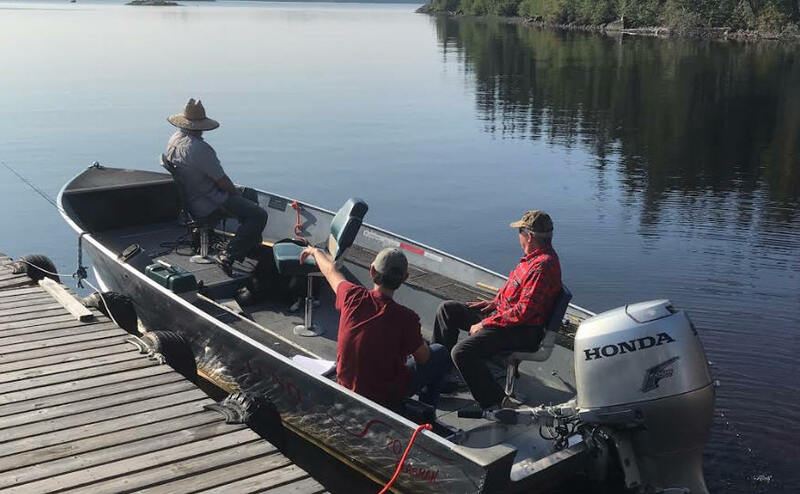 After up to 12 hours in the boat they report a noticeable lack of fatigue associated with other less sophisticated equipment. These fishing platforms are more stable with less side-to-side roll. 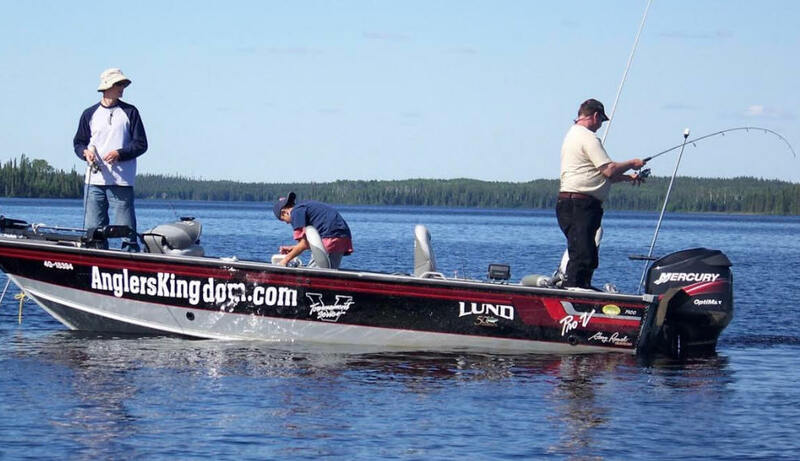 The flat floor and large casting platforms provide incredible range of motion. 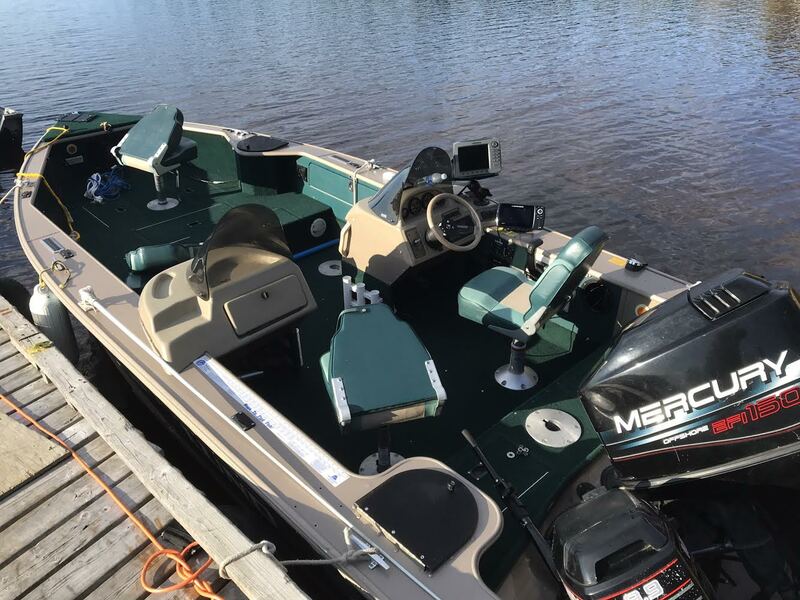 The ISP hull and extra weight of the boat provide a much smoother ride on comfortable pedestal swivel seats. 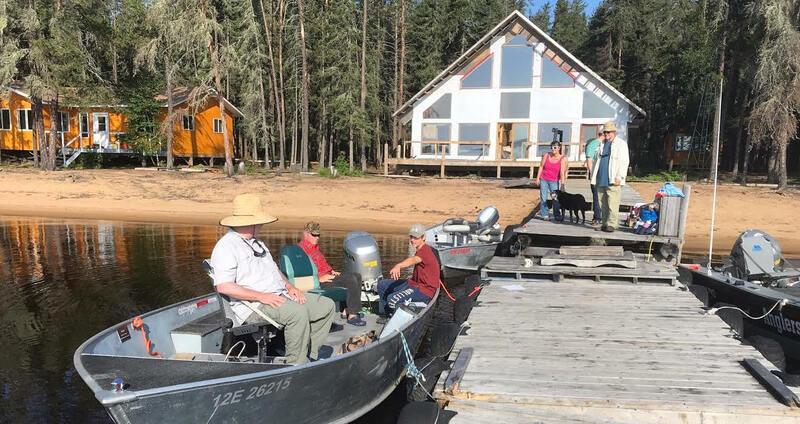 Although guests catch trophy fish less than 400 yards from camp the 40/50hp Honda's can whisk adventurers over 18 miles to the end of the lake in under 40 minutes. 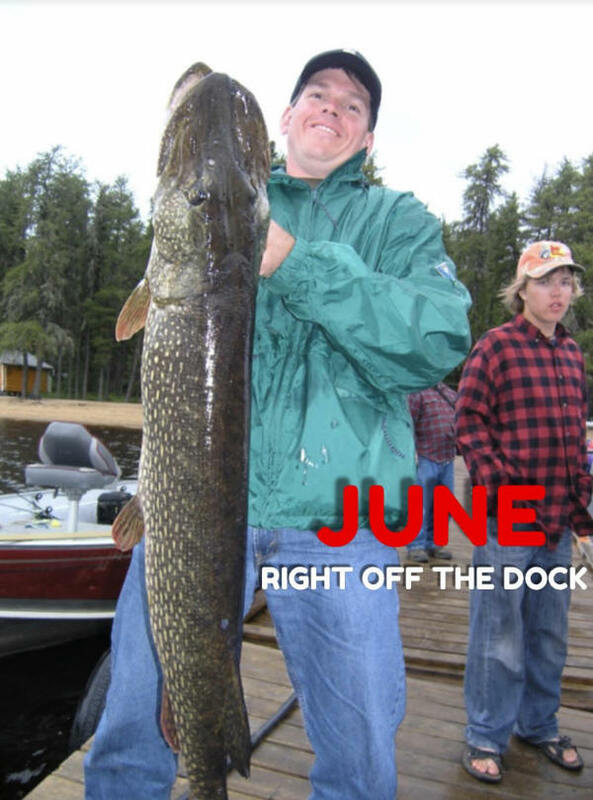 Marine radios keep you in touch should any problem arise. 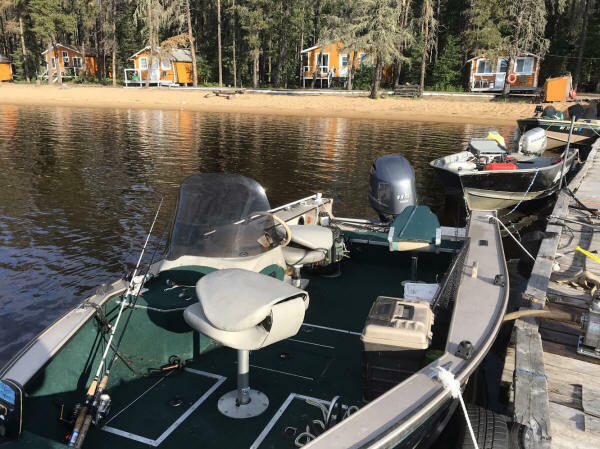 Our staff will go over every item in the boat with you to assure everything is in place and you have no difficulty in operating it. 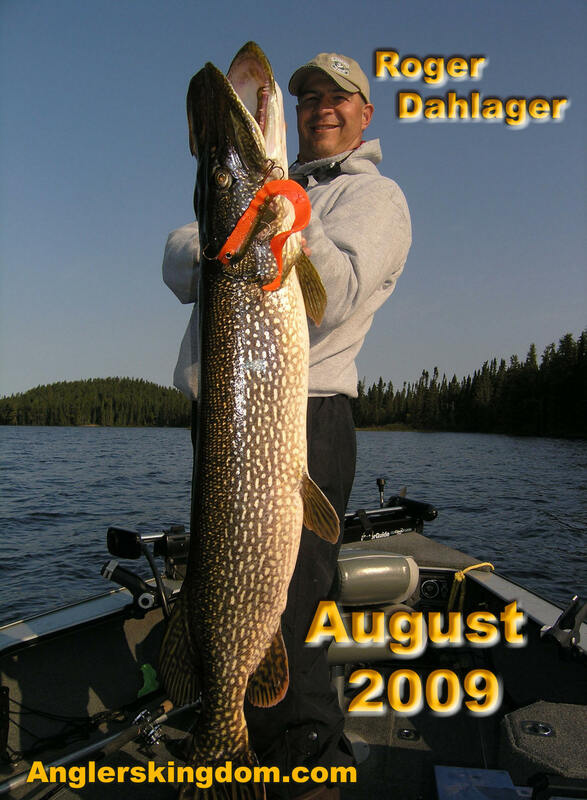 OPERATORS ARE RESPONSIBLE FOR DAMAGE. 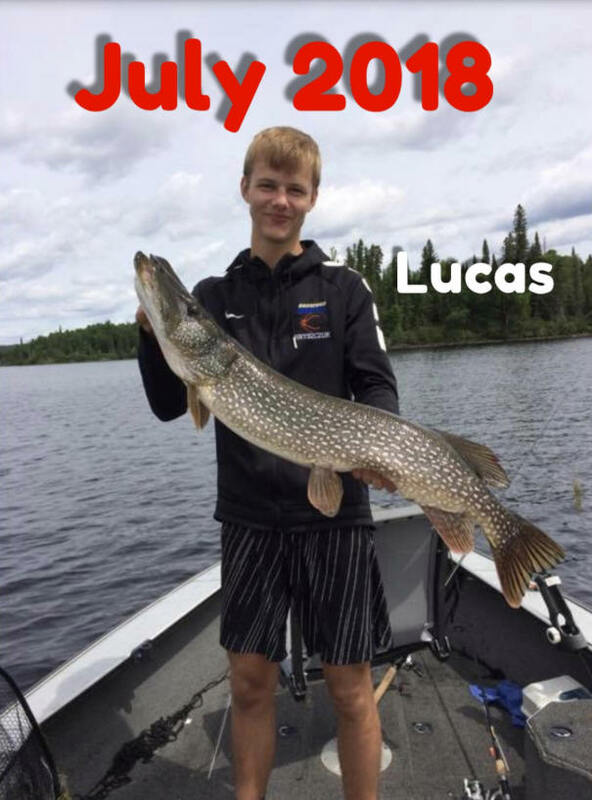 Although we make every effort we cannot guarantee every rock will remain marked. Approach unfamiliar areas with caution. It is recommended that you obtain coverage under you homeowners or other insurance. 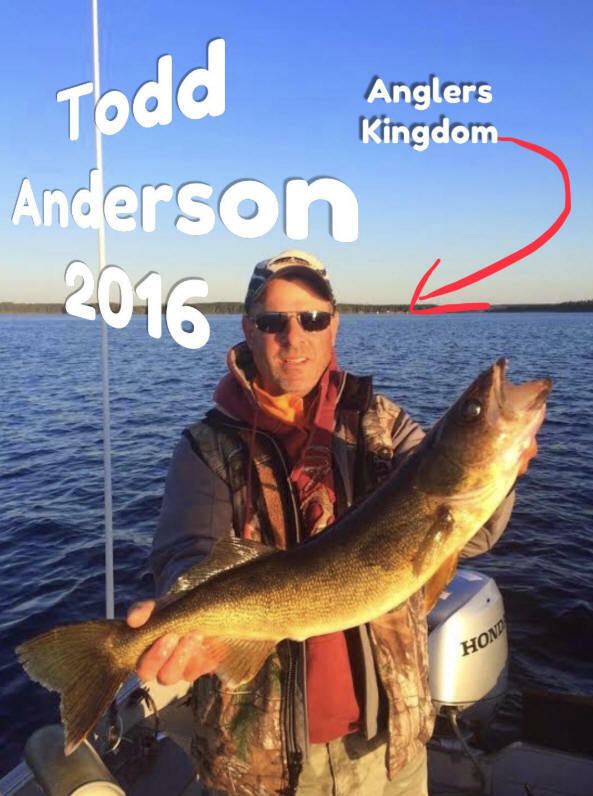 Angler’s Kingdom is not a large fancy five star resort. 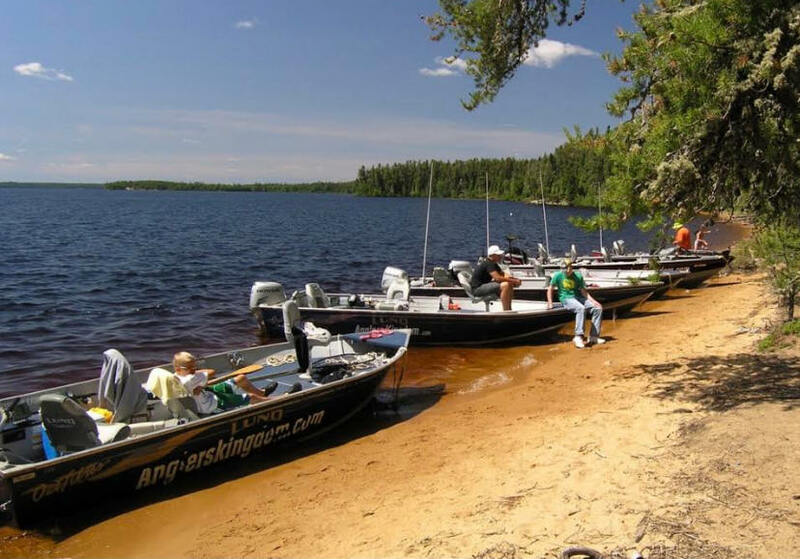 Anglers Kingdom is a small, clean, comfortable, and family owned fishing camp. We provide modern accommodations and equipment in a relaxed and peaceful atmosphere. 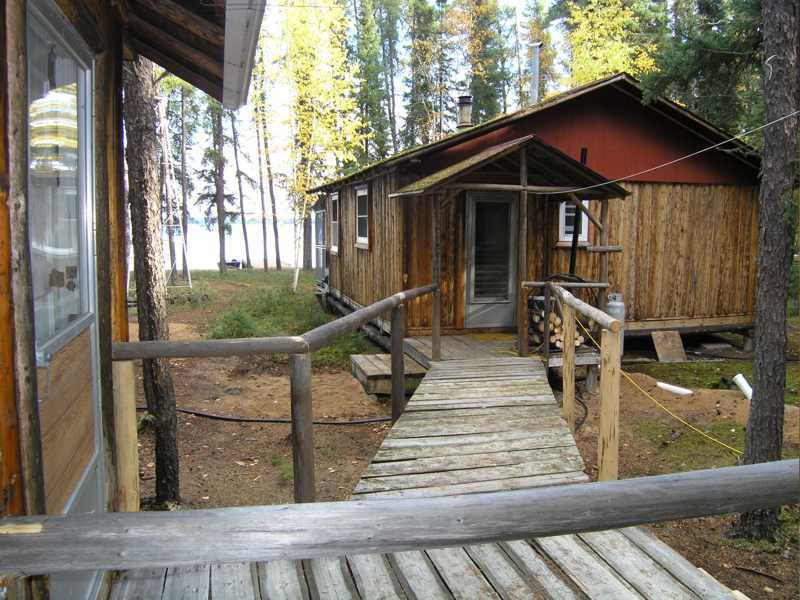 We can accommodate up to 40 guests in six comfortable lakeside cabins. However we intentionally limit groups to an average of 20. 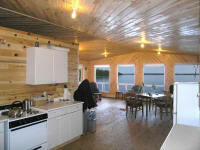 We have a 6 bed and 3 bed cabin - each of which has a 2 or 5 bed “detached bedroom” accessed by a 20-foot boardwalk. 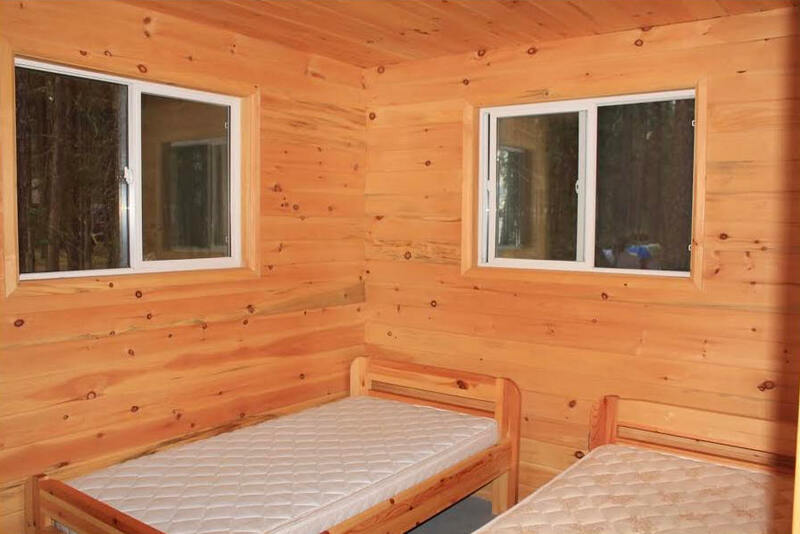 Each of these cabins can sleep 8. 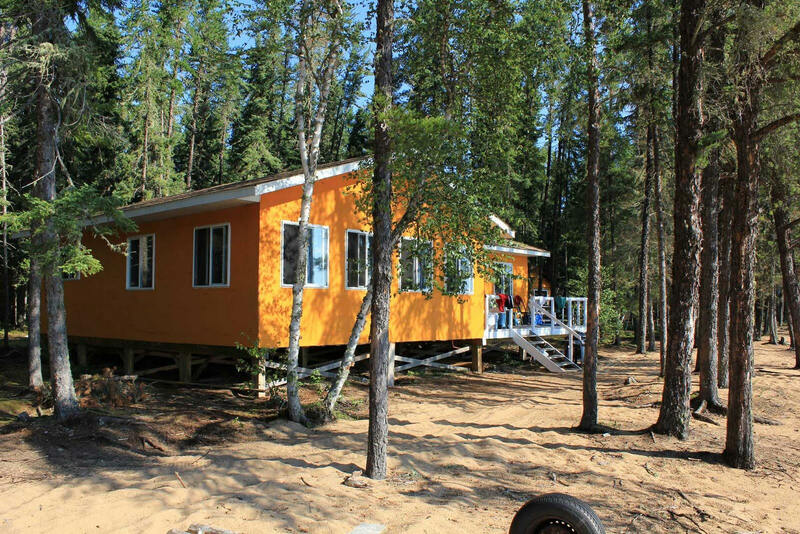 This allows groups to put the people who snore in the sleeping cabin or perhaps the early risers can sleep in them. 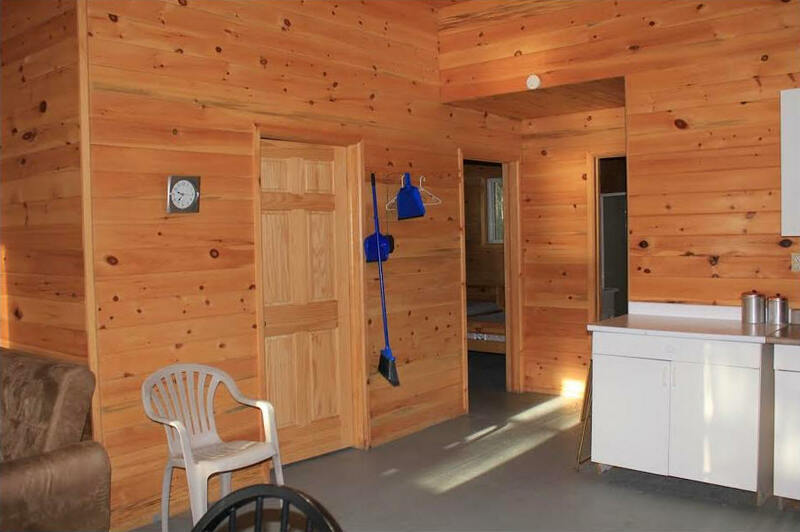 Whatever the arrangement most people appreciate the flexibility. 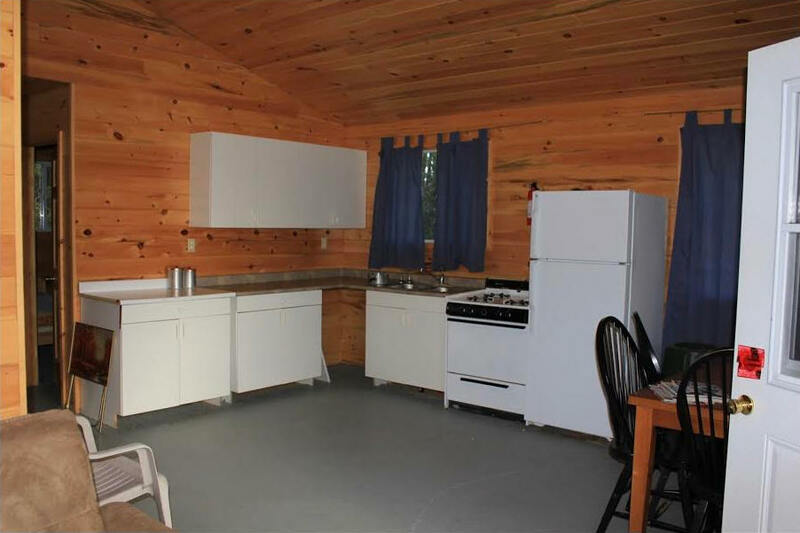 The cabins are fully equipped with fridge/freezer, stove, sink, all the dishes, propane BBQs, etc. 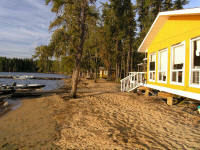 We have shore lunch kits & Deep Fryers. 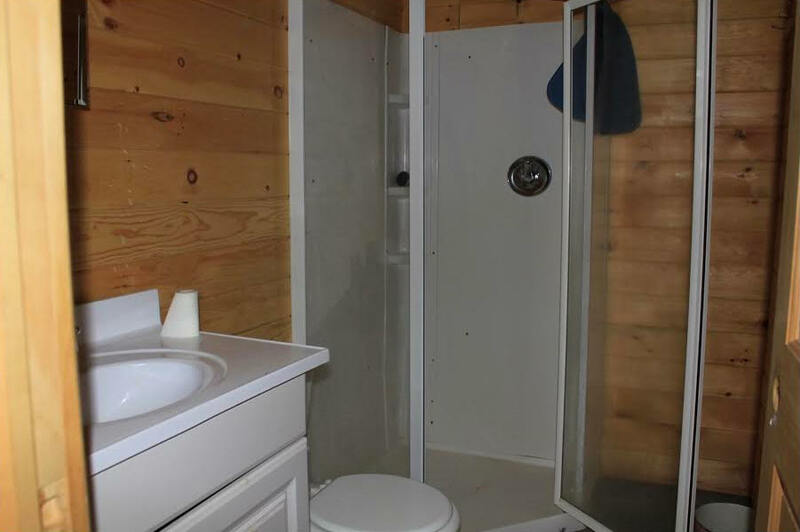 All have bathrooms with toilets, sinks and showers. We supply all the bedding. Face and bath towels are changed midweek. 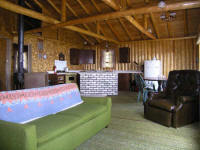 We have new comfortable twin size mattresses, sheets, pillows and blankets. 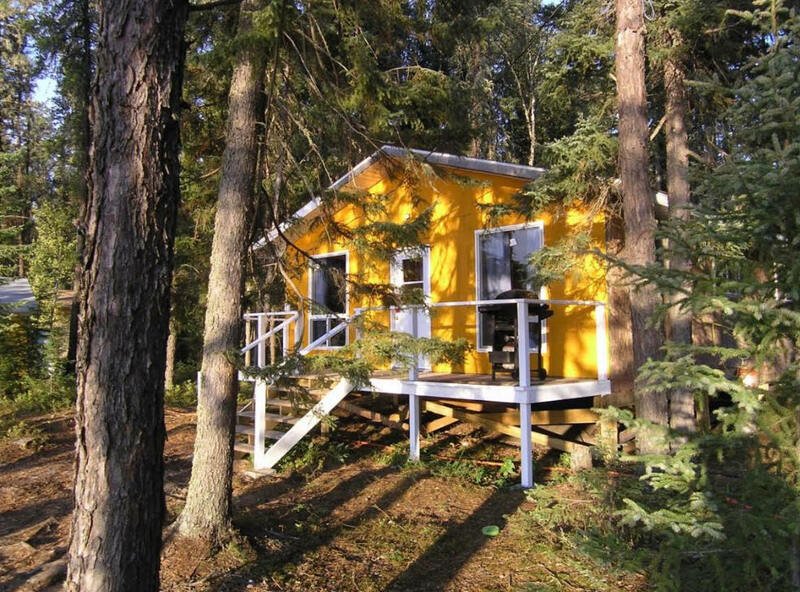 The cabins are expertly crafted of local pine logs and T&G pine, well insulated varnished to a high sheen and sealed tight. 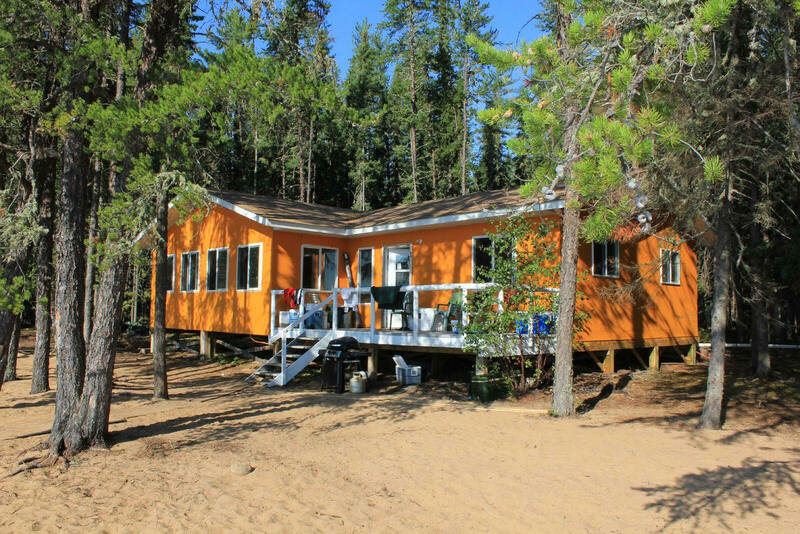 All cabins are on the beach and have excellent views of the lake. 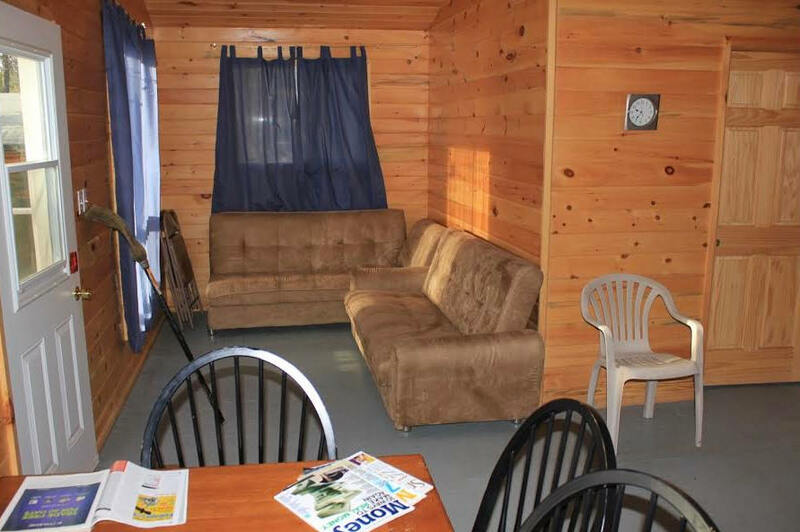 Our generator provides 24-hour electricity. 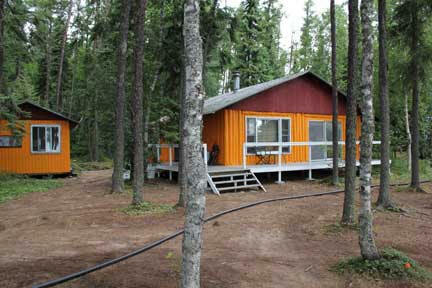 We have Internet and phone service. Guests can also get online with their personal wireless laptops or use mine. Some cabins have CENTRAL HEATING so on those cool nights guest simply turn up the thermostat just like at home. 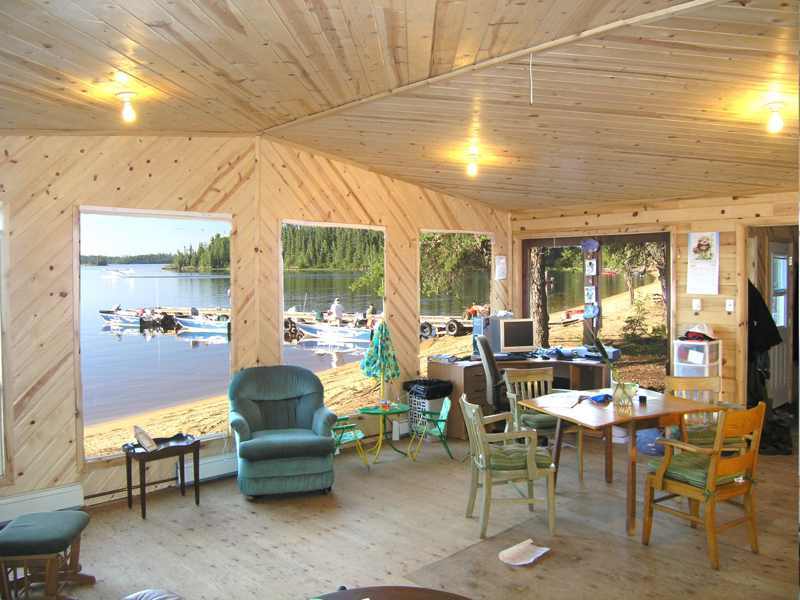 Others have wood stoves or propane heaters.